"Mark was an illustrator in the 30’s. Then, when the war came, he and Caesar worked machining war goods. Bendix, as example, was one of the companies they machined goods for. Caesar liked photography, and that is one of the reasons that Mark came up with the design of the Tiltall Head and Tripod. 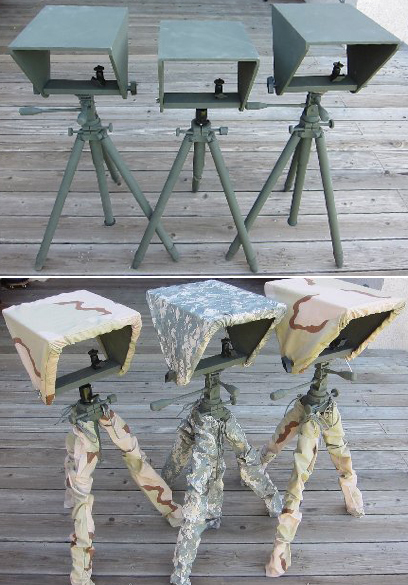 Once the war was over, they started making the tripod which became one of the most famous and best in the world. I still run into people every once and a while that have a Marchioni original and they love it. When Mark began working on the Tiltall, he stopped illustrating and really never talked about his early career. I never knew about it until I was in college and only by accident, when I saw some of his drawings in the attic at 51 Chestnut Street, the family home. So it is not surprising that Leitz or others did not write about it." "Marco Enrico Marchioni was born October 23, 1901 in Manhattan, New York City. His father, Franco Marchioni, was born 1868 in Vodo di Cadore, Italy. His mother, Angela Marchioni, was born 1878 in the same village. His parents married and immigrated to America in 1898 and settled in Brooklyn. They had eight children, of which he was the second born: Caesar (b.1900), Marco (b.1901), Ricardo (b.1904), Fiorenza (b.1908), Giovanni (b.1910), Elena (b.1911), Dora (b.1914), and Madeline (b.1917). They lived at 98 Vernon Avenue in Brooklyn. "His parent's hometown, Vodo di Cadore, is a mountainous municipality in the province of Belluno in the Veneto region of Northern Italy, which is north of Venice and south of the Austrian border. Vodo di Cadore is famous for ice cream. His father and his uncle, Bartolo Marchioni, opened an ice cream factory at 21 Ann Street in the Lower East Side of Manhattan. In 1903 they invented and patented the world's first mechanical device for manufacturing ice cream cones. In 1912 the Marchioni family returned to Italy and spent one year in Vodo di Cadore, where his parents hoped their children would learn the traditional lifestyle of their ancestral village. "At that time in Italy a radical new art movement called Futurism was causing a sensation in the Italian press. The Futurists rejected the Old World lifestyle and embraced a revolutionary vision of a mechanized society that was brutally fast-paced and unsentimental. It is interesting to consider the impact of these radical ideas on an impressionable young artist, whose own work curiously reflects the Futurist's visionary fascination with awesome mechanical complexities. In 1914 the Marchioni family returned to Brooklyn, where the prosperous ice cream business permitted them to leave the unhealthy squalor of NYC and buy a home in Rutherford, New Jersey at 51 Chestnut Street. He attended public school in Rutherford. "During the Great War he was too young for military service. In June 1920 he graduated from high school in Rutherford. During the 1920s he continued to live at home, but he began to commute to NYC to study at the Art Students League of New York, where George Bridgman (1865-1943) and Frank Dumond (1865-1951) were his most influential teachers. In 1928 he studied at the Grand Central School of Art, where his drawing teacher was Arshille Gorky (1902-1948), the founder of the modernist art movement, Anamorphic Abstraction. One of Gorky's other art students was Willem DeKooning (1904-1997), who became America's foremost Abstract Expressionist, and always acknowledged his debt to Gorky. "Marco "Mark" Marchioni's fascination with complex machinery found a grateful audience in the innovative field of science fiction. He sold his first illustration to Hugo Gernsback's Air Wonder Stories in 1929. He went on to draw black and white story illustrations for most pulp magazines in the science fiction genre, including Astonishing Stories, Astounding, Startling Stories, and Thrilling Wonder. He illustrated a regular three-page feature in Thrilling Wonder, called SCIENTIFACTS, which presented a variety of "incredible but true" science facts. Besides illustrating science fiction pulp magazines he also worked for a variety of art agencies that produced newspaper and magazine advertisements. "During WWII he was over forty and not selected for military service. His lifelong interest in machinery lead him to invent a coin-sorting machine, for which he and his older brother Caesar won a patent in 1944. In 1946 he and Caesar invented and patented a sturdy but maneuverable aluminum camera tripod, which they called the Tiltall. Rather than sell the design to a manufacturer, they started a small factory in the family garage and placed ads for the Tiltall in photo magazines. As its reputation for superior performance grew orders flooded in, and the brothers hired five full time employees. "According to Caesar Marchioni, 'Always we hoped to catch up so we could get the time to expand, to plan a factory and so forth, but always the orders kept coming in.' The hired five full time employees and managed to produce five thousand units a year. 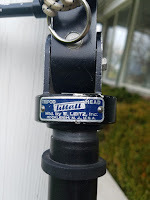 Finally in 1973 they sold Tiltall to Leica, the famous German camera company. In 1975 he retired and moved to 18035 Citron Avenue in Fontana, California.
" According to the editors of Thrilling Wonder, "Mark Marchioni is a serious, dark-eyed chap, who likes good books and music. His favorite hobby consists of fooling around with mechanical gadgets. His favorite authors are Eando Binder, Dr. Keller and Edward Elmer Smith, Phd." Mark Marchioni died at the age of eighty-five in a hospital in San Bernardino, CA, on October 15, 1987." Curiously, I am writing this post in San Bernardino CA. Bear with me as the three photos here will make no sense without a lot of explanation. Many of you write me regarding foot replacement, but this is a knotty conundrum (see earlier post). I will try my best here to answer the requests and make an inexpensive suggestion below. To wit: the original Marchioni had a foot design with a fixed rubber tip and a descending spike which the Leica folks continued (middle photo, upper left) until near the end of the Leica Tiltall (my conjecture) when they changed to a simple no-spike rubber foot (middle photo, bottom center). Following Leitz, Fred Albu of Camera Barn (another earlier post) made several slight redesigns to his Unifot version of Tiltall and in his Star-D (see original Star-D before Mr. Albu). Fred reversed the foot design to a fixed spike with a descending rubber foot that continued from his Unifot/Star-D to the Omicron and to the current Tiltall by King Home Taiwan. We're not done. Oliver Yang, KingHome, has discontinued the Fred Albu design (TEP-5) and has recently redesigned the King Home Tiltall foot, making a very beautiful iteration of the earlier Marchioni/Leitz design - the fixed rubber with descending spike (bottom photo, left). Here's the rub. The threading on the Marchioni foot is different than the Leitz is different than the Unifot which is the same its brother, Star-D, which is the same as the Omicron and the same as the KingHome BUT it has been discontinued. Enlarge the bottom photo with a click and note that Oliver has correctly made his new version without threads - good thinking! Lots of glue should resolve this historic mess. But expected sell price will be $15 per foot inclusive of shipping. This foot iteration should fit all Tiltall iterations. However a matching set of the new feet will cost as much as an entire Ebay'd Tiltall - and from the Ebay deal you would also get an entire set of replacement parts - aka the entire tripod - with your three replacement feet. Here's the better idea. 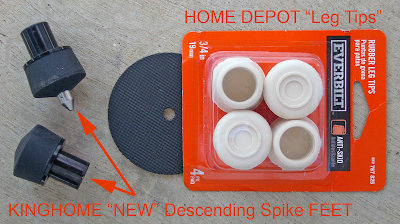 DUMP THE SPIKE, GET A RUBBER. For me, the only time the spikes in my Tiltall feet seem to become deployed is at the very moment I set the TILTALL down on my client's newly polished maple floor. Forget the spike, and solve the replacement foot question inexpensively and harmlessly just as Leitz did in their final iteration. Where to find a RUBBER: visit your closest home medical equipment supplier for a 3/4" rounded cane tips. The "rounded" specification is important vs the "flat" cane tips. But the rounded tips seem to be harder to find, often at $15 each. I best I have found (shown in the middle photo, left) are from Canes Canada 2632 Garland St. Calgary AB T3E 4E3 Canada, tel: 1403-217-8091 Cost of minimum purchase - 6 pieces 'cause you need 3 packets of 2 each - with shipping was $22 Canadian or about $3usd each. If you cannot find a cane tip, then search for "rubber leg tips 3/4 inch" (photo, below) from Amazon - at about $6 each plus shipping. Finally, back up to the bottom picture above, Home Depot does offer white rubber tips - four pieces for $2 or $.50 each - white is OK - but the black spray paint will cost you $10. Or, best, search Ebay with "black 3/4" rubber chair leg furniture tip" and find the deal for 24 Shepherd tips at $0.66 each and make friends with all the Tiltall owners of the world. Hmmm? OK, maybe such a good idea, I will do it - but they would not be less than $10 per set of three with postage. UPDATE: I followed my suggestion and have added one or three BLACK Shepherd rubber "tips" to my replacement part offerings. Not only the original Marchioni. 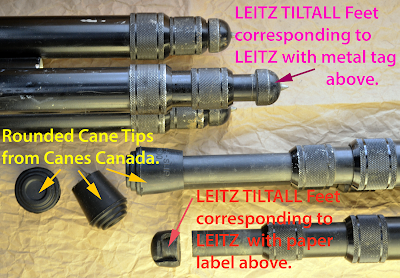 The next two iterations, Leitz and some Unifot/StarD, also have the long threads. 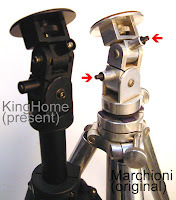 When ordering the top handles (TEP-1, 2) for the camera platform, note that the Marchioni original (right) has two very long threaded bolts compared with the current KingHome Tiltall (left). This means that you will need some kind of tubular spacer placed onto the bolt to effectively shortening the threads inorder for the present handles to work with the original Marchioni. 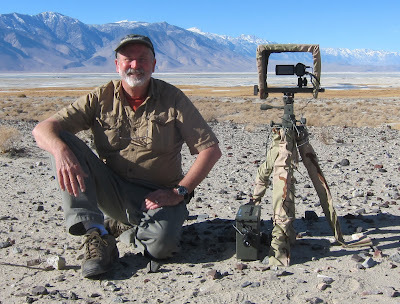 Steve Krauss (below) reports that the part "Hillman #880414" from Lowes works well. Again, this is because the current handles are not as deeply threaded as earlier. Change seems to be at the Unifoto iteration. 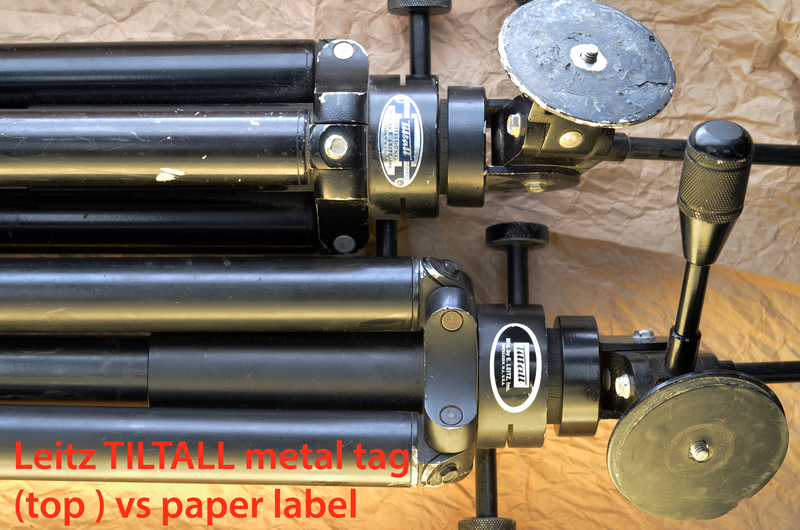 Another update from Steve Krauss (Feb 2014) - I finally had time to run by Lowes and get some steel sleeves - 1/4" x 3/8 x 1/2" - they work PERFECTLY, just as you indicated. These steel sleeves I got are dimensionally identical to the handle - same outside diameter, slide perfectly over the threads, perfect function. It's a "Hillman #880414". Thank you so much for your fine parts and help. Now I have two fully-functioning classic Tiltalls! With my carbon fiber Gitzo I'm well equipped. If there has been a single plaint these years regarding the Marchioni brothers' design, it is the non-removable Tiltall head. And for about that same length of time there has been a rumour that Leitz had played with a short lived version with a removable head. I had never yet seen one. 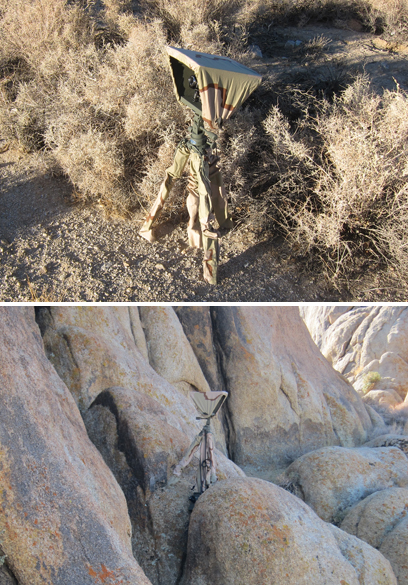 Thanks to a TEP Handle inquiry from Alan Abramowitz (http://abramowitzstudio.com) and his photographic proof above, we have our evidence (click to enlarge). What history we have come by seems to suggest that the brothers begin Tiltall as a head-only design, but once attached to its body, both the Marchioni and the iterations that followed - with the Leitz exception above - Unifoto and its brother, Star-D; Omicron and presently, KingHome - all have stayed with a fixed head design. Thank you again, Allan for your photos. If others have discovered some Tiltall variants in their travels, please drop us a jpeg to post. 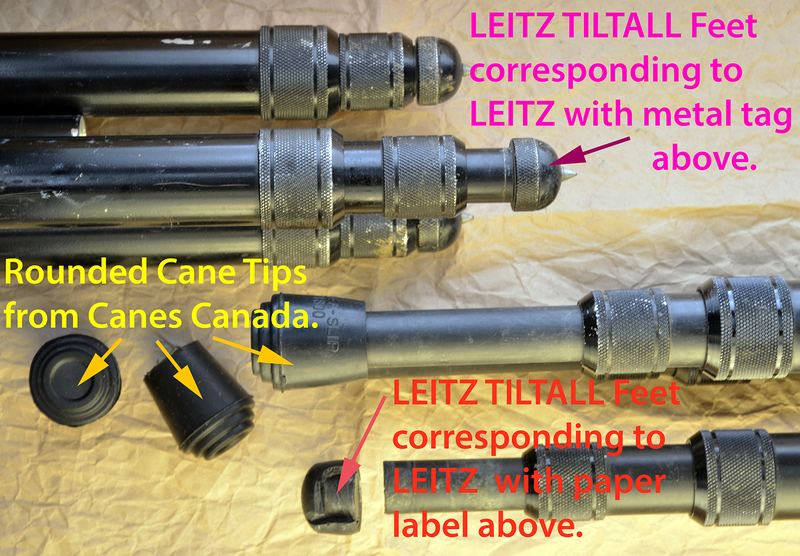 Another variation of the Leitz Tiltall from Mike Campos - here the head unthreads from the column itself. Not, as above, from a more expected a 1/4-20 threaded bolt. I have not tried to remove my head from the column with my four Leitz by unthreading - I will. From the Uniphot to present, the column was glued into place. Also, as above, Mike's Tiltall head has a separate label on the head - and a metal one at that. All my Leitz Tiltall have only the "body" label - a couple, metal and a couple, paper.